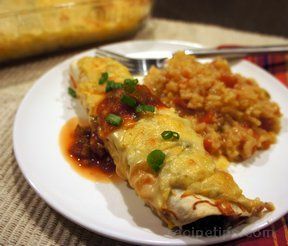 An easy way to enjoy beefy bean burritos. 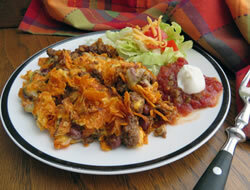 The cheese and crushed Doritos add flavor and a little crunch to this Mexican casserole. Brown hamburger and drain grease. Add the chili beans and chili powder to the hamburger. Put the hamburger mixture in a 9 x 13" pan. Over the hamburger spread the cream of mushroom or chicken soup. Cover top with slices of Velveeta cheese. Crumble Doritos over top. Bake at 350°F for about 1/2 hour or until cheese is melted and bubbly. 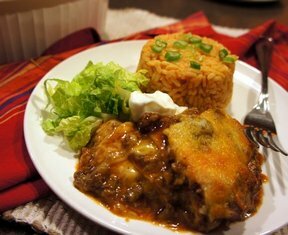 "This was one of the main dishes we fixed last night for Mexican night. I loved it. Just the right amount of beans, cheese and crunch. A couple of the kids thought it had too many beans but everyone else thought it was great. 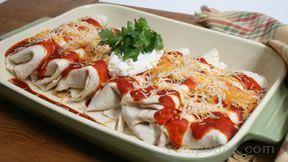 I served it with all our favorite Mexican fixings."